- Publisher Devotional vignettes that encourage strong Christian character. - Publisher Character counts. And distinctively Christian character counts most of all. To build it, though, we need role models. 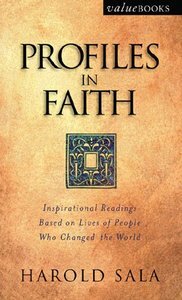 Profiles in Faith delivers them. These devotions offer biographical sketches of nearly one hundred admirable men and women-famous and unknown, historical and contemporary-all worthy of emulating. Each sketch concludes with a brief Scripture selection and practical application questions. Devotional vignettes that encourage strong Christian character. Character counts. And distinctively Christian character counts most of all. To build it, though, we need role models. Profiles in Faith delivers them. These devotions offer biographical sketches of nearly one hundred admirable men and women-famous and unknown, historical and contemporary-all worthy of emulating. Each sketch concludes with a brief Scripture selection and practical application questions.